Amorphous silicon (a-Si) photoreceptor drums, which are long-life and highly durable products, changed the role of the photoreceptor drum from a consumable item to a component with a long product life equivalent to that of the actual printer. High definition imaging is achieved with the high resolution of a-Si drums and our original high-precision processing technology. a-Si drums are composed of function-sectional layers and experience very little characteristic changes even after long use due to the highly stable substances utilized for each layer. Furthermore, the drums do not deteriorate from exposure to solvents or high temperatures. Reduce, reuse, recycle. Kyocera a-Si drums help users produce environmentally-friendly products and mitigate generation of waste materials. These drums have a response speed of 15m/sec or less. Moreover, blade cleaning can be performed at 1m/s or faster. a-Si drums demonstrate the best performance in high speed machines. 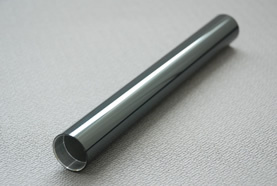 30mm (diameter) X 250mm (length) (For A4 paper); other sizes available upon request. Kyocera is the first manufacturer*2 to have succeeded in producing drums with a high-hardness a-C protective-surface layer. Moreover, Kyocera developed ultra-high durability a-Si drums which made it possible to further enhance the long operating life, more than three times, from printing about 300,000 A4 sheets to printing roughly one million. This product realizes high durability without the use of a heater by adopting a-C surface layer, which is superior in terms of hardness and oxidation resistance. *1 For electrophotographic printing of A4 sheets by a-Si drum of 30mm diameter without a heater in a longitudinal direction (based on research by Kyocera; as of August. 9, 2011). Durability depends on paper type, environment and print pattern (ink density, darkness, etc.). *2 First achievement of the practical use of an a-C surface layer in the world (based on research by Kyocera; as of August. 9, 2011). Realizing durability equal to printing roughly one million sheets by adopting the a-C surface layer, which is superior in terms of hardness and durability, this product makes it possible to cut the replacement frequency of drums to less than one-third, and contributes to a decrease in environmental impact through waste reduction. Kyocera's a-Si drums are capable of realizing high-quality imaging by optimizing the thin-film composition of the protective-surface layer, even in a high-humidity environment without a heater for drums*3. Furthermore, heaterless drums contribute to power savings. *3 For use in a-Si drums without heaters, appropriate cleaning of the surface is necessary. Newly-developed high-intensity LED chips are realizing 4 times higher luminosity than conventional products (based on experiments by Kyocera). This new product realizes ultra high-speed printing of 180m/min, which belongs to the world's top class in the field of electro-photographic devices. These two technologies make it possible to realize high image quality, and are optimum solutions for the high-definition process of liquid-toner development. 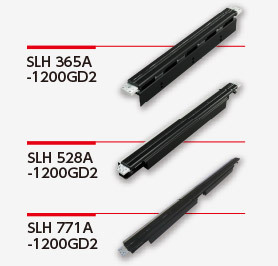 The SLH Series realizes an approximately 30%*4 reduction of power consumption adopting the low-current design achieved by the use of high-intensity LED chips. The SLH Series supports users to design ecological products. *4 Comparison with conventional Kyocera products. The design of the SLH Series, such as high-intensity LED chips, lens, and driving, are optimized for the use of a-Si drums. The SLH Series, therefore, makes it possible for users to maximize the performance of a-Si drums. *5 Maximum printing speed may vary by interface design. *6 Grayscale control is optional. For more information about this page, please contact us using the following form.